It’s mid-July and LoA2 players are burning with passion! The Angels have once again brought a great new event to the warriors of Sapphire. 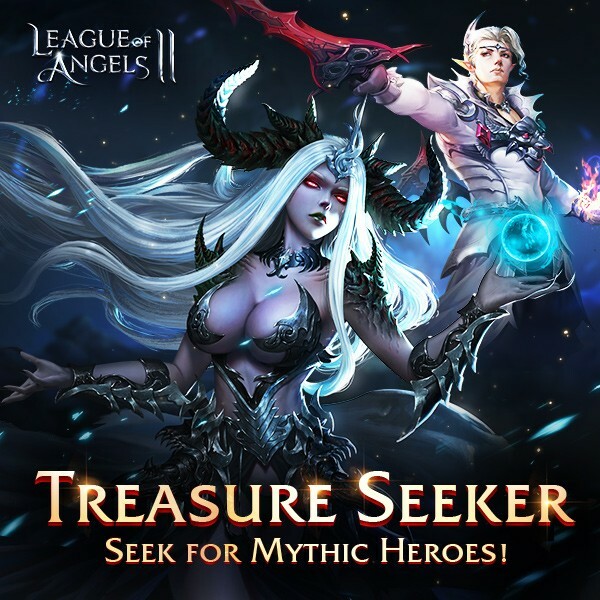 The brand new Treasure Seeker event is about to go live, so pick up your pickaxes and uncover the buried mysteries of LoA2! Access: Click on Events icon. Rewards: Mythic Hero shards, Legendary Hero shards, basic resources. Treasure Seeker is similar to the classic game Minesweeper, but instead of avoiding mines players must find buried treasure. Use the number clues to locate the sections with treasure! Below are some key terms to understand before you get you started. Use: Prospecting a section for treasure will cost 1 Pickaxe, if players do not have enough materials, they can spend Diamonds to prospect. How to Acquire: During the event, players can get Pickaxes by completing specific quests in the Events panel, from Recharge rewards, and from directly buying with Diamonds. Treasures: Each section may contain Treasure or a number. A number signifies the amount of treasures in the sections adjacent to that section. A red flag means there is no number, and prospecting that section will yield 1 Credit but no treasures. 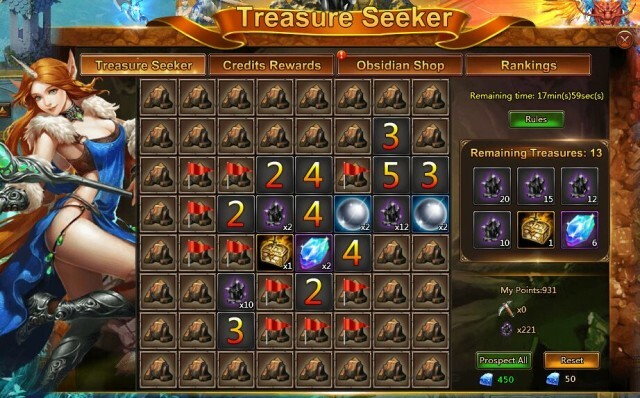 Resets: When all treasures have been dug out, that round of Treasure Seeker will automatically reset free of charge. 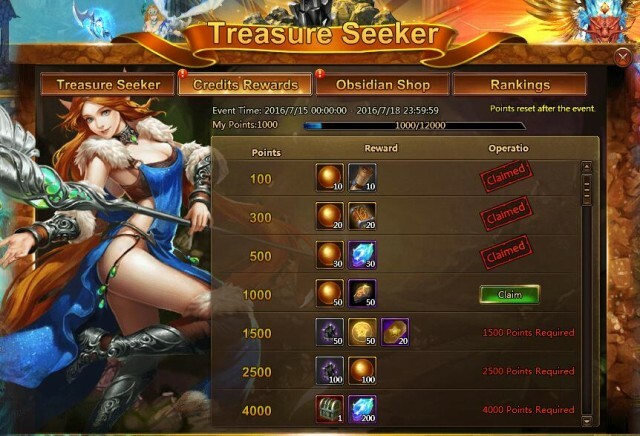 Players can also spend Diamonds to reset a round without prospecting all the treasures. Earning Credits: Prospecting a number will earn 1 Credit; Prospecting treasure will earn Credits based on the quality of the treasure. Credit Reward: When a player’s Credit reaches specific amounts, they will receive corresponding Credit Rewards. Credit Rankings: The top 10 players with the most Credits will appear on the Credit Rankings, and receive super valuable Eternal Set Chest! 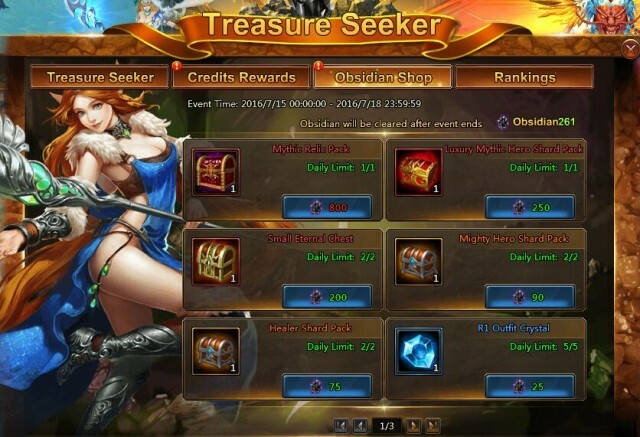 Prospecting can also yield Obsidian, which can be exchanged in the new Obsidian Shop for various items. Obsidian Shop offers: Mythic Hero shards, Mythic Relic shards, Eternal Set shards, Legendary Hero shards, Outfit Crystals and Essences, and other basic resources. Break out your sweeping skills and master Treasure Seeker to reap huge rewards. Keep in mind any remaining Pickaxes, Obsidian, and Credits will be cleared when event ends, so be sure to spend them all in time!